Copyright © 2008, McAfee, Inc. 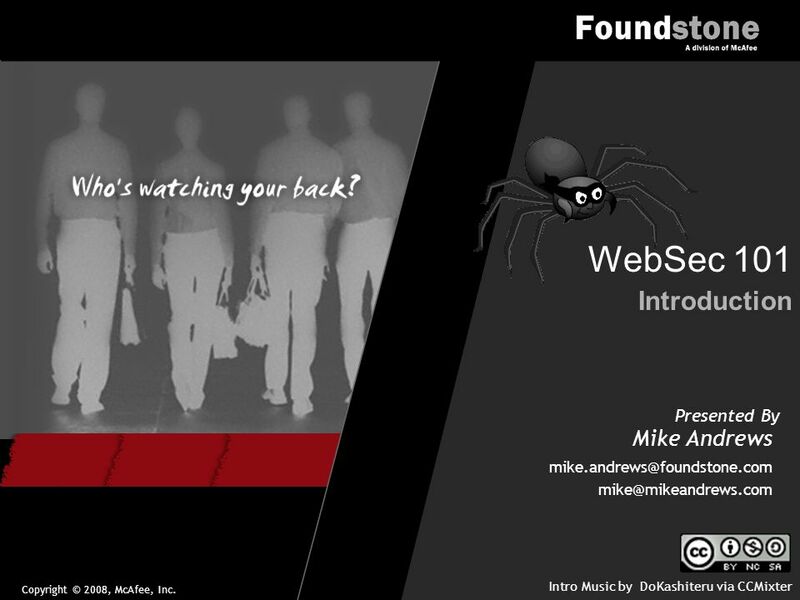 Presented By Mike Andrews Introduction WebSec 101 Intro Music by DoKashiteru. 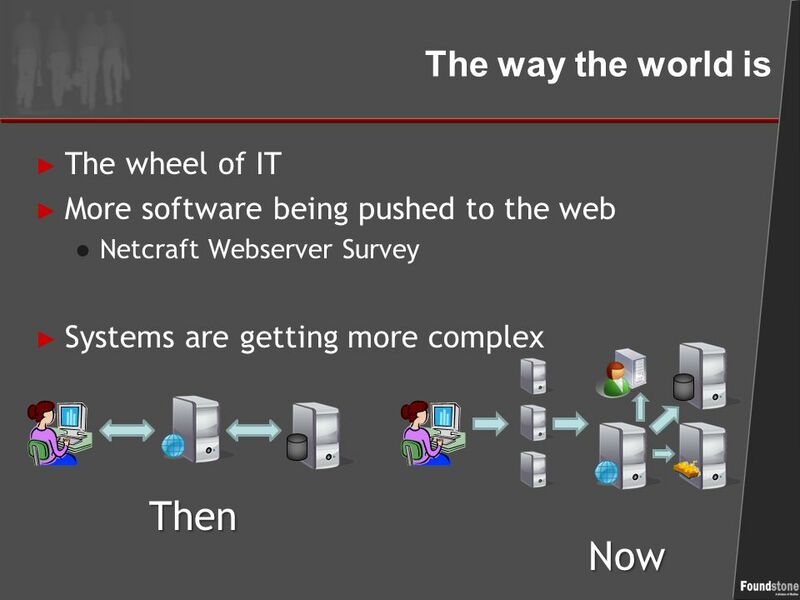 4 Bad news… ► It seems to be getting much easier to find vulns in web-based software ● 63% of all vulns disclosed 2008 were in web apps [Symantec Internet Security Threat Report Trends for 2008] ► Where are the vulns? ► Why? 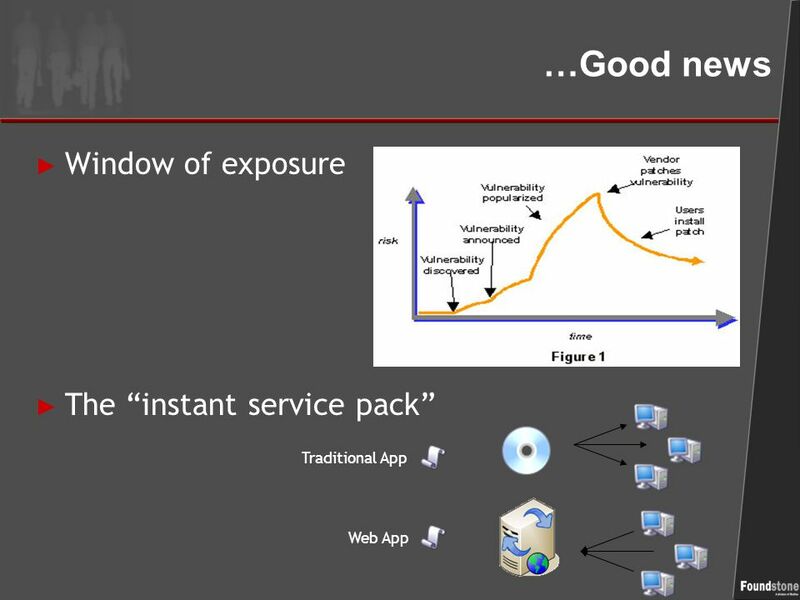 The total number of publicly reported web application vulnerabilities has risen sharply, to the point where they have overtaken buffer overflows. This is probably due to ease of detection and exploitation of web vulnerabilities, combined with the proliferation of low-grade software applications written by inexperienced developers. 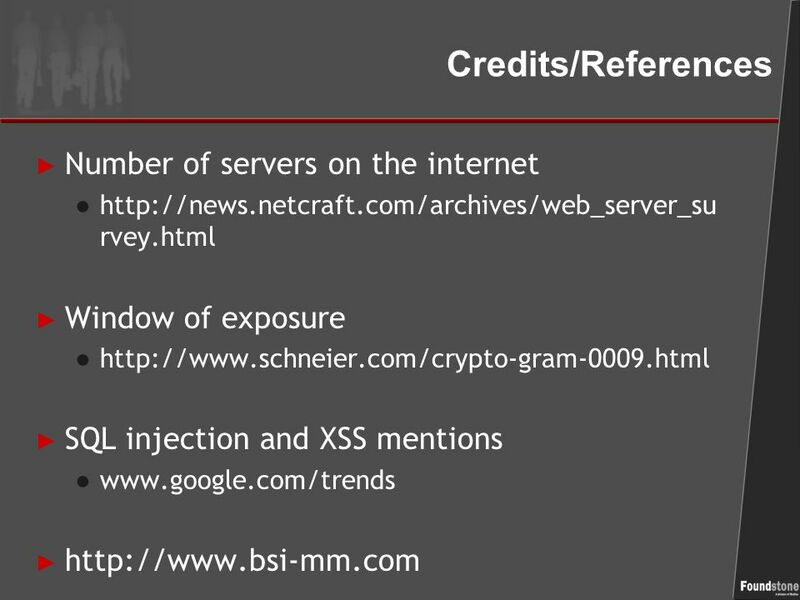 In 2005 and 2006, cross-site scripting (XSS) was number 1, and SQL injection was number 2. 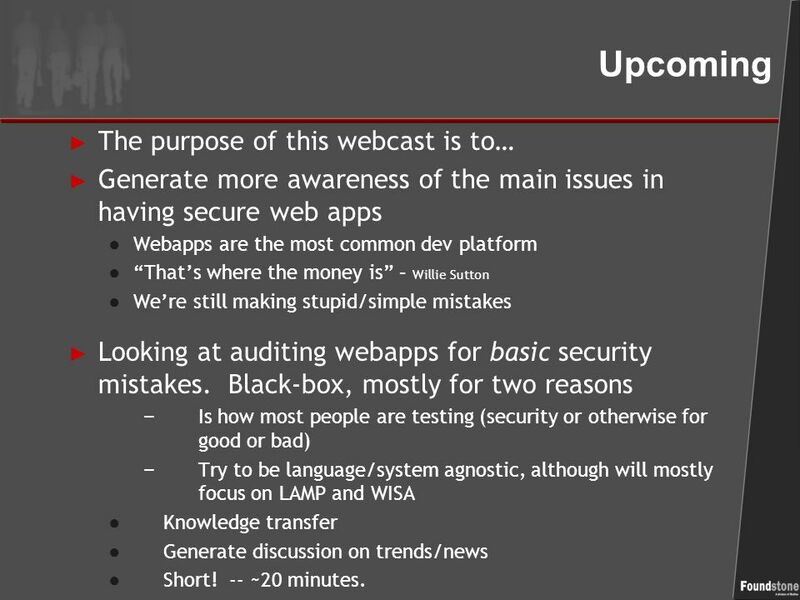 8 Upcoming ► The purpose of this webcast is to… ► Generate more awareness of the main issues in having secure web apps ● Webapps are the most common dev platform ● “That’s where the money is” – Willie Sutton ● We’re still making stupid/simple mistakes ► Looking at auditing webapps for basic security mistakes. 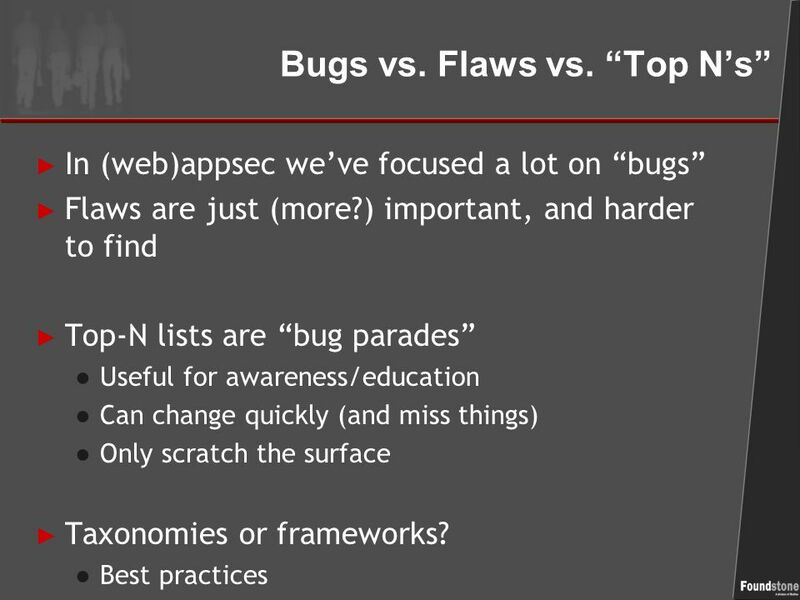 Black-box, mostly for two reasons − Is how most people are testing (security or otherwise for good or bad) − Try to be language/system agnostic, although will mostly focus on LAMP and WISA ● Knowledge transfer ● Generate discussion on trends/news ● Short! -- ~20 minutes. 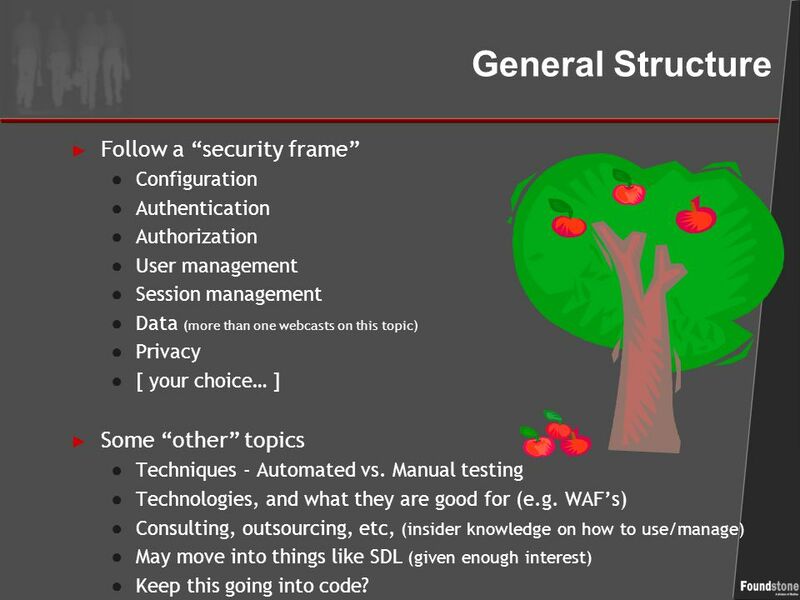 10 General Structure ► Follow a “security frame” ● Configuration ● Authentication ● Authorization ● User management ● Session management ● Data (more than one webcasts on this topic) ● Privacy ● [ your choice… ] ► Some “other” topics ● Techniques - Automated vs. Manual testing ● Technologies, and what they are good for (e.g. WAF’s) ● Consulting, outsourcing, etc, (insider knowledge on how to use/manage) ● May move into things like SDL (given enough interest) ● Keep this going into code? Download ppt "Copyright © 2008, McAfee, Inc. 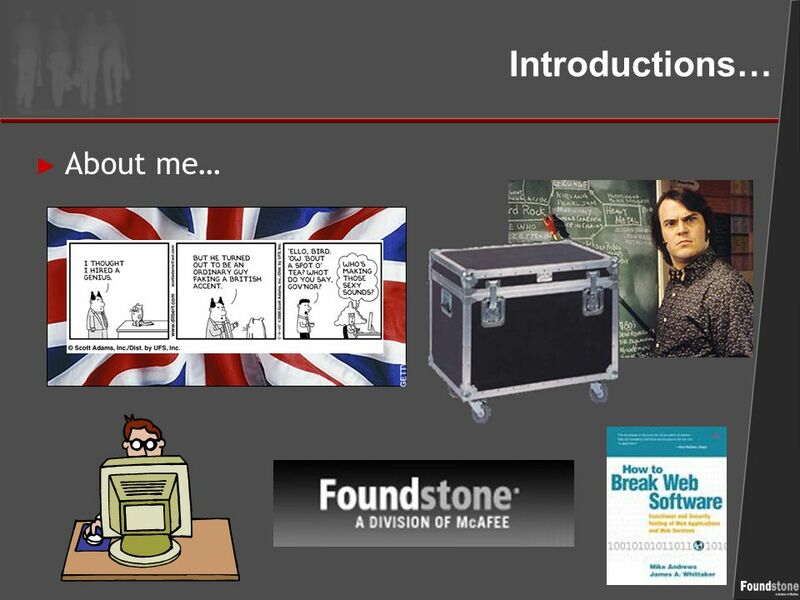 Presented By Mike Andrews Introduction WebSec 101 Intro Music by DoKashiteru." Writing Secure Code By Sam Nasr, MCAD, MCT, MCTS March 18, 2009. 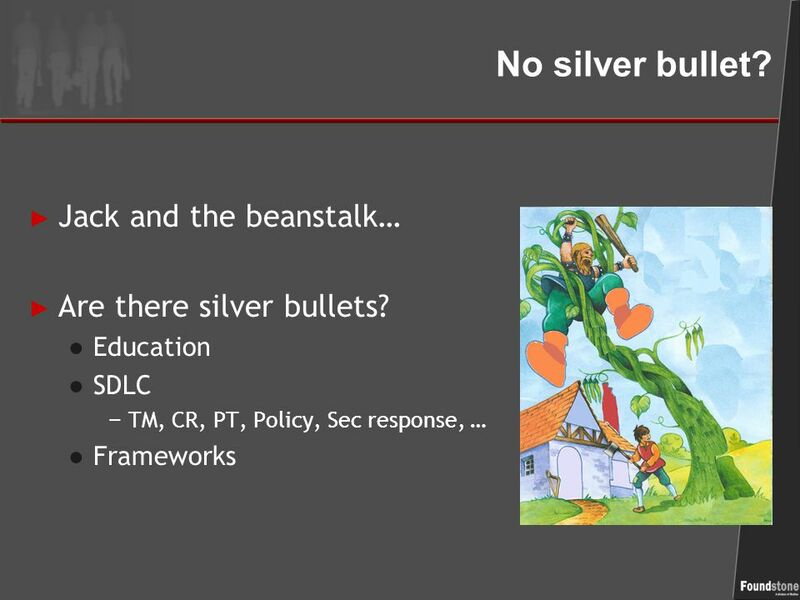 Web Security Never, ever, trust user inputs Supankar. Agenda 1) Introductions 2) Expectations 3) Problem 4) Plan One Stop Shop Organize Application Staff Implement Portal Develop Data Warehouse Tools 5) Solution. More Secure Online Services Powered by the Microsoft SDL Bryan Sullivan Security Program Manager, SDL Microsoft. 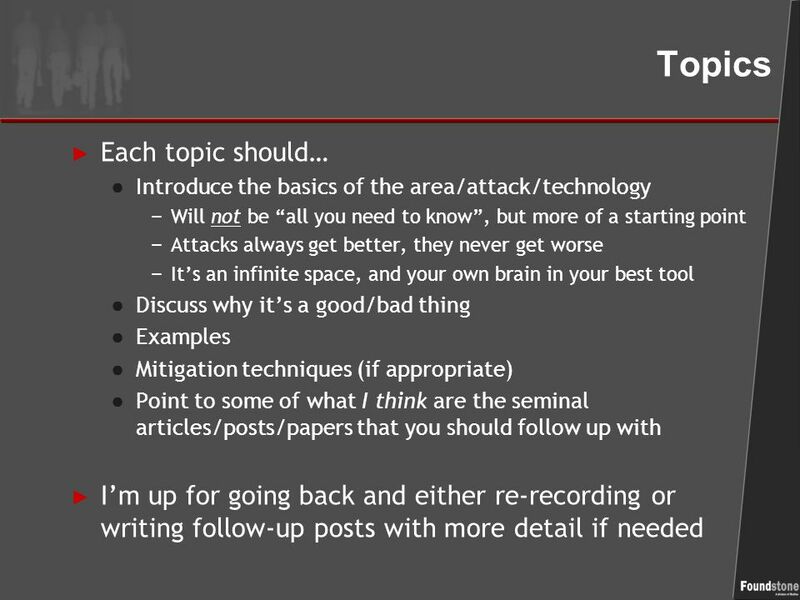 Hands-on SQL Injection Attack and Defense HI-TEC July 21, 2013. Copyright © 2009, McAfee, Inc. 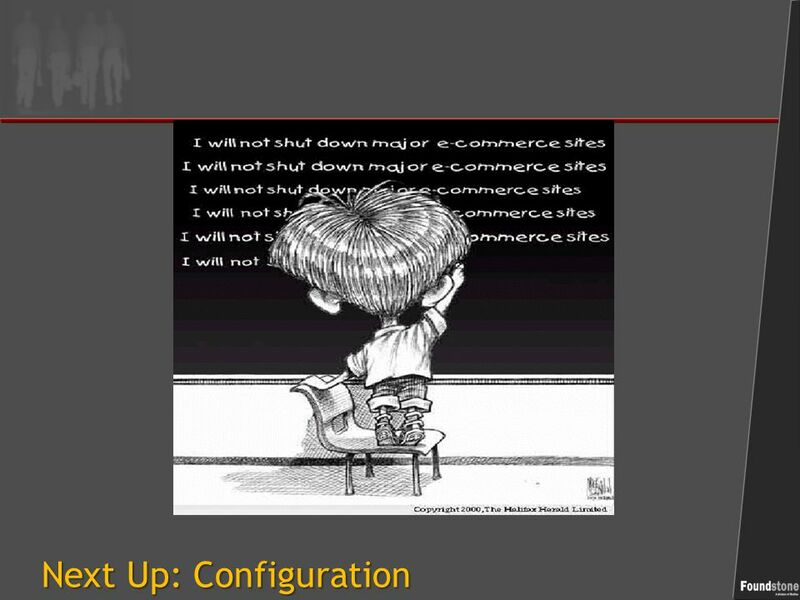 Presented By Mike Andrews Configuration WebSec 101 Intro Music by DoKashiteru. SDL Tridion Community Webinar Navigation and SDL Tridion. © Leaf Solutions, LLC. All Rights Reserved What’s New in Everett Microsoft.Net V1.1. 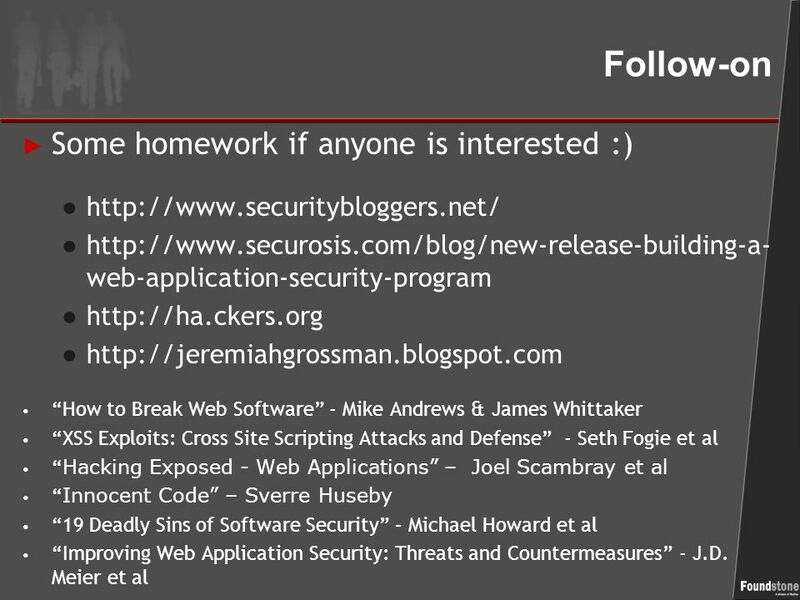 Web Trust Boundaries and Security Vulnerabilities Haris Volos and Hidayat Teonadi CS739 – Distributed Systems. Creating Stronger, Safer, Web Facing Code JPL IT Security Mary Rivera June 17, 2011. Engineering Secure Software. 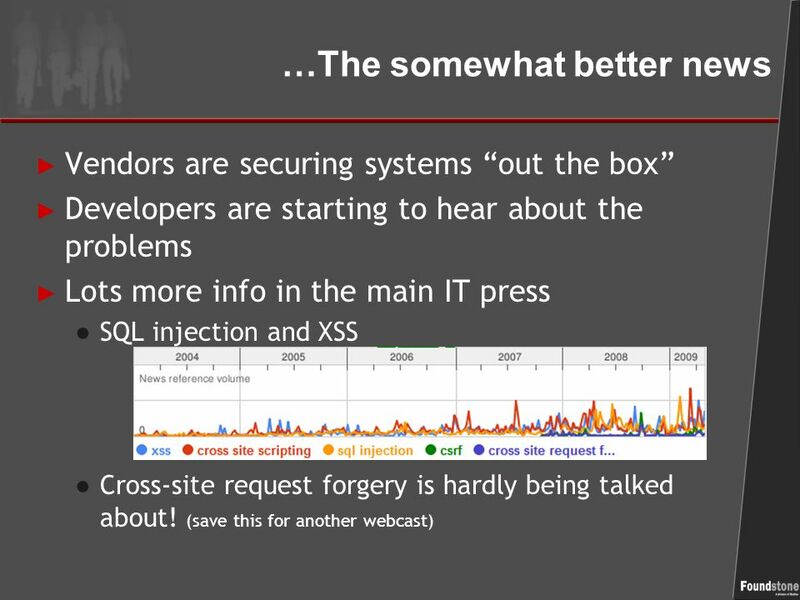 Does Security Even Matter?  At your table, introduce yourselves: Your name, degree, & app domain What is your favorite software. Advanced Security Center Overview Northern Illinois University. Full Disclosure: Is It Beneficial? Project Based Information Systems Tim Schultz 12/02/02.